Sam used to show up at Ithacon pretty regularly. He's a great guy to talk to and very friendly, as is his wife. I think he rode his motorcycle to the show a couple times. I've never seem the second Sailor's Story book, and never got around to ordering it. The USS Stevens book came in the mail yesterday--it's a lot thicker than I was expecting--plan to dive in this weekend. One surprising thing: the book says the stories are copyright to Sam and not DC; I wonder if he was able to strike some kind of deal since he wasn't using any trademarked characters. 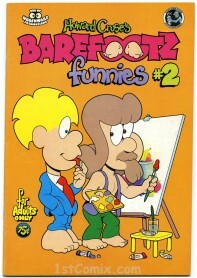 The two Barefootz undergrounds are two of the funniest comics I ever read. Haven't seen much of Cruse's other work. Marvel started a pretty nifty graphic novel line, in 1982, beginning with The Death of Captain Marvel. Jim Starlin basically capped off his cosmic masterpiece, with Mar-Vell finding that it wouldn't be Thanos or some other villain who would kill him; it would be cancer. Starlin takes us through the stages of grief, has all of the greatest minds of the Marvel Universe come together and fail. Captain Marvel, a character begun to secure a trademark on a good name, with an uneven history, was allowed to go out with dignity. Even the Skrulls paid tribute to him. It is a powerful work, slightly marred by a unnecessary metaphoric battle; but, probably Starlin's best work. New Mutants introduced us to the next generation of X-Men and did it in a pretty exciting manner. It had been a while since we had the first new, young X-Man, in Kitty Pryde, and here Chris Claremont began exploring the mission of Xavier's School, to help gifted students, whose gifts are beyond academic. It's not as powerful as Claremont's other X-Men graphic novel, of the period; but, it's a fine piece of work. God Loves, Man Kills is powerful, allowing the characters to directly address prejudice, especially spawned by a religious authoritarian figure, who spouts hatred and bigotry. It probably overdoes some elements; but, it has some great scenes and really showcased Brent Anderson's talent. Of course, it would factor heavily into X2. Daredevil is Frank Miller and Bill Sienkiewicz at the height of their talent, on Marvel's hottest character of the time. It's not as gonzo as Elektra Assassin; but, it delivers the goods. Futurians is a favorite of mine. Dave Cockrum gets to strut his stuff, with his own pseudo-X-Men. In the future, a group of scientists attempts to alter the past by sending back genetic info, which grafts itself to the DNA of a group of people, who then feel a compulsion to use those abilities to benefit mankind. On parcel went further back than expected, creating the man who will become Avatar, an immortal who brings centuries of experience and tactical thinking to the team. The team also gains the aid of a creature who lives in the sun and has the power of a goddess. As you can see, it doesn't break new ground and the X-Men analogies abound; but, this is Cockrum's more swashbuckling take on the material. Fans of the earlier new X-Men issues could rejoice to a return of that more fast paced, action/adventure approach, before subplots overwhelmed things. Cockrum ended up taking it to the indie scene and ended up regretting it, as he felt he probably could have had more life with it at Marvel. Maybe so. The graphic novel starts things with a bang. After leaving the X-Men book and Marvel, Claremont got to play in some favorite sandboxes and one of those was Star Trek. He crafted a terrific graphic novel, aided by Adam Hughes' art, and brought together favorite characters from across Star Trek history and pitted them against a common foe. The one downside is that enemy is yet another Claremont retread of Alien (something he beat into the ground, in X-men). However, the personalities help elevate it above another bug hunt and it was nice to see the Star Trek universe handle something like that. In the wake of Dark Knight, Year One and the hype for the Batman movie, a cottage industry was formed: the Elseworlds books. It began with a nifty historical piece, Gotham by Gaslight, by Bryan Augustyn and Mike Mignola. The premise is simple, Batman takes on Jack the Ripper. Mignola captured a lot of attention for this and Augustyn creates a damn good Victorian adventure, with a Batman to match. The Batmobile is a horse, the costume created from a fencing vest and cloak. Knives take the place of batarangs. This really takes Batman to his roots: those of Zorro and Sherlock Holmes. The book was followed by an inevitable sequel (Master of the Future), with Eduardo Barreto on art. This one draws inspiration from Jules Verne, as Batman takes on a science villain, who shares much with Nemo and Robur. It wasn't as popular or as highly regarded; but, I love the thing. It's steampunk, before that became a cliche. Enemy Ace: War Idyll, by George Pratt, features Hans Von Hammer, a dying old man, living in a sanitarium, in Germany. He is visited by a journalist to be interviewed; but, the conversation moves beyond Von Hammer's life. The journalist is an American Vietnam veteran, who carries his own memories of horror and survivor's guilt. Together, the men share their experiences and their grief for those who didn't make it. It's a powerful work, beautifully painted by Pratt. It was nominated for the Eisner and Harvey awards and was once part of the reading list at West Point. My last two are from a mainstream creator, but published elsewhere. The better known is Fax from Sarajevo. This book deals with Joe Kubert's friend and business partner, Ervin Rustemagic. Rustemagic was head of Strip Art Features, a company which packaged and sold comics properties to publishers throughout Europe, and who were part of a partnership with Malibu, under the Platinum Editions label. There has long been a thriving comic scene in Yugoslavia, with tremendous work done throughout the region. After the breakup of Yugoslavia, wars broke out between the newly independent republics, including Serbia and Bosnia-Herzegovina. Rustemagic and his family lived and worked in Sarajevo, when the fighting broke out. Rustemagic's offices were destroyed, taking multiple pieces of original art with it, including works from Hal Foster, Kubert, Alex Raymond and more. Rustemagic works to get his family out of the war zone and updates friends via faxes. Kubert illustrates the harrowing; but, ultimately happy story in the style you come to expect, from a veteran of war comics; but, it has a personal connection that goes beyond Sgt. Rock or Enemy Ace. Prior to the events in Fax from Sarajevo, Kubert published another graphic novel, via Platinum Editions: Abraham Stone: Country Mouse, City Rat. The story is set at the turn of the century and features a young man's journey to the big city. It's been a long time and my memory is hazy; but, the book allows Kubert to indulge in a bit of pseudo-western and urban adventure story. I recall the art, more than anything. Kubert really got to strut his stuff here, more than he had in a long time. It's better known in Europe, where superheroes don't dominate and I stumbled across it in my local shop, back in 1991, thanks to the owner, who ordered it in, where it sat on display, ignored in favor of X-Men and such. I saw it and saw Kubert's name and art and snapped it up. Kubert came back to the character in two issues at Epic, where the hero ends up in the early days of Hollywood, as well as with Pancho Villa (who also ended up in Hollywood). Good stuff and one of Kubert's lesser known works. Harvey Kurtzman returned to Marvel (he did the Hey Look comics, for Timely) and got to do a hardcover graphic novel. Well, really, it's Kurtzman basically doing a Mad take on Marvel characters. It's not quite the genius of the Mad comic books; but, it's a slice of fun. I'm glad Kubert had a chance to do some of this work late in his career. A little disappointed that DC couldn't find find a away in their business model to be the publisher. Not just Marvel characters--also took on slasher movies, caveman movies, and other genres. I was pretty disappointed though, and you'll have to go pretty far to find a bigger Kurtzman fan. It reminded me of late-period Bob Hope or Stan Freberg or Bob & Ray: it had the form of the classic stuff and was professionally done, but missed the spark that made it genuinely funny. But the collaborators were great; Dave Gibbons, Bill Stout, and Tom Bunk especially turned in excellent work. Yeah, I would tend to agree with that assessment of Strange Adventures. It was a bit uneven, though the Silver Surfer parody was pretty good. Harvey was having health problems around this time, which might factor into it. Within a couple of years he did one of those videos that Stan Lee hosted, with Harvey and Jack Davis as guests, and Harvey is visibly in bad shape. he spoke in a very halting manner and never moves from the table. He die not long after. Sabre was one of the first graphic novels, from the period where the name came into vogue (though it was marketed as a "comic novel." There had been others before (the Byron Preiss books, His Name is Savage, Blackmark, Rhymes with Lust); but, this was one of the template books that set the tone for the graphic novels that followed, and the first sold via the Direct Market.. Don McGregor and Paul Gulacy deliver a swashbuckling, post-apocalyptic tale of a rebel who tries to free a group from an amusement park, fighting an overseer and his minions. The action is fast and violent and the prose is pulpy as can be. McGregor is a bit wordy; but, it works fairly well. Gulacy uses Jimi Hendrix as the model for the hero, which adds a layer of coolness to the whole thing. It's not a Top Ten kind of book; but, it is an important one and a good read, with great art. Beowulf was from Jerry Bingham and it recounts the epic poem, in a lush, illustrative graphic style. Bingham had bounced around a bit in comics; but, he really hit it out of the park here, before producing the art for Batman: Son of the Demon. This one features insane superhero Badger in a martial arts tournament. Think Enter the Dragon with a cross between Travis Bickle, Howling Mad Murdock and Randle McMurphy. Weapons are allowed and Badger arms himself with a pair of metric wrenches! Now that's badass! Time2 is Howard Chaykin's ode to noir crime fiction, jazz music, mid-century fashion, and graphic design. Both graphic novels feature hardboiled mysteries, a bit of romance, and plenty of visual wonder, even if the stories are a bit murkier than American Flagg. The Hero Alliance was an attempt at showcasing the behind the scenes of a superhero team, what happens in between the fights. It features art from a young Ron Lim and Bart Sears and plenty of enthusiasm, even if the art is uneven and it tends a bit too much to cheese & beefcake, rather than storytelling. It's an intriguing concept, though. The Stars My Destination is Howard Chaykin's adaptation of the seminal sci-fi novel, by Alfred Bester (who wrote Green Lantern, in the 40s). The first part was done for Byron Preiss, then it was finished and the complete story printed at Epic. Like the other Byron Preiss books (such as Chandler: Red Tide), it has separate text, with single panel illustrations, rather than telling the story through successive story panels. Empire was created by Samuel R Delaney and Howard Chaykin. A rebel searches for the pieces to a powerful weapon, with which to defeat an oppressive empire. Lots of swashbuckling space opera here. Swords of Heaven, Flowers of Hell was a collaboration between Michael Moorcock and Howard Chaykin, featuring Moorcock's Erekose, one of the aspects of the Eternal Champion. The story was created for the format and is referenced in Moorcock's later writings. It was published by Heavy Metal and features Chaykin really starting to strech his artistic wings (as with his other work of the era, such as Stars and Empire). Heavy Metal also published Archie Goodwin and Walt Simonson's official adaptation of Ridley Scott's Alien. The duo, who built their tandem name on Manhunter, are in tremendous form here, as Goodwin's script and Simonson's visuals convey the atmosphere and characters of the film in a new medium. It influenced a lot of graphic sci-fi that followed and has since been reprinted. I first encountered the work of Jean Giraud, aka Gir, aka Moebius in Maurice Horn's The World Encyclopedia of Comics; however, I, first saw full stories here (I missed the early Heavy Metal reprints) and many others first encountered his work in these albums, thanks to Archie Goodwin, who helped bring Moebius' work to Epic. If I need to sell you on the beauty of Moebius' work, you just aren't trying. There are newer collections of his work; but, these are sentimental favorites, for me. Oh, the Harry Canyon sequence, from the Heavy Metal movie? That was pretty much a ripoff of The Long Tomorrow. Moebius said no to using his stories in the film, which took Long Tomorrow and Arzach off the table. They, instead, presented the rather derivative Harry Canyon and Tarna. The Fifth Element? Well, that was inspired by Moebius and Jean-Claude Mezieres (Valerian), which is how Luc Besson ended up approaching them to design the film. A lot of the internet would have you believe that the idea came from Harry Canyon. Nope, it was Moebius and Valerian, all the way. Valerian (or Valerian & Laureline, if you prefer). Valerian first appeared in 1967 and charmed and thrilled audiences right up to Jean-Claude Mezieres retirement of the series, in 2010. The series focuses on Valerian, a spatio-temporal agent of the Galaxity. Basically, he's a troubleshooter who works across time and space, for an intergalactic empire, whose homebase is a massive city-planetoid. Laureline was an 11th Century peasant girl who accompanies Valerian back to the 28th Century, where she is trained as a spatio-temporal agent and becomes valerian's partner. In the early stories, Valerian is the hero and Laureline is more of a supporting character. As the series progressed, Laureline stepped out as the more capable and level-headed of the two, while Valerian was something of a dim bulb. The earliest stories were standard good vs evil space opera; but, political, social and ecological concerns started mixing into the stories, thanks to writer Pierre Christin (who also collaborated with Enki Bilal), and the series grew into something bigger. Through it all, it maintains a sense of playful fun, while also slipping in some allegory and adventure. The series was first translated in the US, by Dargaud USA, the American branch of Dargaud International, the publishers of Asterix, Blueberry and the magazine Pilote. They published the volumes Ambassador of Shadows, World Without Stars, Welcome to Alfolol, and Heroes of the Equinox. Dargaud closed down their US branch and switched to licensing their material for translation. In 2004, Byron preiss' iBooks published Valerian: The New Future Trilogy. The genesis of this was the release of Luc Besson's The Fifth Element. The movie features Bruce Willis as a cab driver who gets caught up in the battle of good vs evil. Valerian creator Jean-Claude Mezieres worked as a conceptual designer on the film, along with Jean "Moebius" Gireaud. The film had halted pre-production when Besson went to Hollywood to do Leon (aka The Professional). During the hiatus, mezieres went back to work on Valerian, producing the story Circles of Power, which featured a cab driver, who aids Valerian and Laureline. luc Besson liked the image of the floating cab and scrapped the original story of a robot factory worker and replaced him with a cab driver. The movie was a hit and byron Preiss secured the reprint rights of Circles of Power and the two preceding stories, which form a bit of an arc. valerian and Laureline are now operating without the resources of the Galaxity, which added a new wrinkle. many elements in the three stories mirror The Fifth Element, though there are plenty of differences. A common factor, though, are Mezieres designs for various alien races. In recent years, UK publisher Cinebook has been reissuing the Valerian albums, from the beginning, in English. Cinebook has published 15 of the 21 volumes, with two more on the way in April and June, as well as the hardcover Valerian: The Complete Collection, Vol1, which reprints City of Shifiting Waters in its entirety, as well as Empire of a Thousand Planets and the iintial story, bad Dreams, which is seeing its first English translation. Oh, and Laureline wears an outfit much like Leia's, in World Without Stars. You could easily make the same connections with other works of sci-fi and illustration, including Frazetta's fantasy paintings and 50s movies, not to mention Flash Gordon. Leaving all of that aside, Valerian is a wonderful world of adventure, humor, exotic worlds and lifeforms, and two layered and intriguing heroes. One can only hope that Besson does them justice in his film. So far, all I have seen are the visuals, which capture the look (as best it can); but, the tone remains to be seen, let alone the characters. The Fifth Element had much of the same tone, so there is hope. however, it's all here in the books. One of my personal favorites is Heroes of the Equinox, where Valerian competes against other heroes, in a race to reach an island, to help repopulate a planet. The other heroes are thinly veiled analogs of Marvel characters, including Thor, the Hulk and Dr Strange. The whole thing is a bit of a delightful romp, with a cute ending. If you love sci-fi and comical adventure, you must read this series. XIII was created by writer Jean Van Hamme and artist William Vance (William Van Cutsem) and first appeared in 1984. the series features an amnesiac man who turns up, wounded, on a beach, where he is treated by an alcoholic, disbarred doctor. He has the Roman numeral XIII tattooed on his chest and people come looking for him. he ends up displaying astounding physical and martial skills. if this sounds familiar it's because the series was inspired by a then-recent thriller novel, The Bourne Identity. Van Hamme and Vance took their character into a deeper conspiracy, as XIII may be the assassin who shot the President of the United States. The first 5 volumes revolve around XII trying to uncover his true identity, during which he discovers evidence of a conspiracy of 20 people to launch a coup, by assassinating the President. Volumes 6-8 further get into XIII's past and his father. 9-13 take him to Central America, where he meets a man who claims to be his father, who was believed murdered. The final volumes revolve around a treasure hunt and the climax of the battle with the conspirators. Vance's art is fantastic, conveying the mood and thrills of the cat and mouse games, capturing expressions well, and bringing characters to life. There are also great supporting characters, like Maj. Lauren Jones, an Army officer who ends up aiding XIII; Col. Amos, of the FBI, who has video evidence of XIII assassinating the President, yet knows the story goes deeper. Gen Carrington, head of a secret Army spec ops program, which XIII was involved in, and whose side is somewhat nebulous. Kim Rowalnd, who may or may not be XIII's wife, new President Sheridan, who may or may not be an ally to XIII, and The Mongoose, an assassin searching for XIII. The series was adapted into a tepid mini-series, with Val Kilmer badly miscast as the Mongoose; then, turned into a middling tv series. Both were badly shot and featured a miniscule budget, which tempered the whole exercise. the graphic novels are far better. There is a companion series, XIII: The Mystery, which fills in backstory on the supporting characters. Spirou and Fantasio have been around quite a while. Spirou was the mascot of Spirou magazine, an elevator operator, whose adventures were created by Rob-Vel. He sold the character to the publisher and it has continued ever since. In the 1940s, Jije took over the character and introduced Fantasio, a reporter. The pair came to greatness under Andre Franquin, who took them on their greatest adventures and introduced the Marsupilami. The character underwent an update in the 70s and a couple more, including one by Yves Charland (creator of Freddy Lombard) which wasn't completed. Eventually, it was fully modernized by Tome and Janry. It is this duo that Cinebook has mostly featured. After a handful of Tome and Janry books, Cinebook started reprinting the Franquin classics and now alternate between the two. Much like Tintin, Spirou & Fantasio travel the globe, having adventures and covering news stories. However, their adventures are moore rooted in the fantastic and they tend to have a wilder tone. The satire is broader, especially under Tome & Janry. They frequently parody movies and other pop culture, such as the Godfather, in Spirou in New York. Franquin sticks with more traditional adventure but kept the humor quotient high. Marsupilami became a favorite, as this wild creature made for great visual gags (and a terrible American mis-mash of a cartoon). If you enjoy Tintin, you may enjoy Spirou & Fantasio. Lucky Luke is the cowboy, created by Morris and scripted by Rene Goscinny (Asterix) until his death, and several others since. Morris passed away in 2001 and Achde has continued the series. Cinebook has published 63 volumes, with 2 more on the way, by summer. Lucky Luke is a cowboy who wanders the West, righting wrongs and having adventures. Along the way he meets the famous and infamous, with the greatest infamy coming from the Dalton brothers, who get meaner as they get shorter. Luke rides his faithful horse Jolly Jumper, and is occasionally accompanied by an overzealous dog, Rantanplan. Luke is faster than his own shadow, as can be seen in a cartoon on the back of most volumes. In the classic years, neither Luke nor Jolly Jumper were without their trademark cigarettes; but, bowing to pressure, they now chew on a blade of prairie grass. The stories are light-hearted fun, written for kids but thoroughly enjoyable for adults. The plots are a bit repetitive; but, what can you expect after well over 60 years? Lucky Luke was adapted into several cartoons, including 1971's Daisy Town, which was distributed by Disney, in the 80s and a cartoon series, with Hanna-Barbera. Terence Hill (They Call Me Trinity, My Name is Nobody) played the character in two movies and a tv series; and, Jean Dujardin (OSS 117: Cairo, Nest of Spies and The Artist) played the Lucky Luke in a rather surreal take on the character. The Scorpion is fantastic swashbuckling adventure, set in 18th Century Rome, where the the intrigues of the Vatican take center stage. These are really beautifully drawn and filled with action. Robert Louis Stevenson's pirate returns 20 years later, to take up a voyage for Lady hastings, whose husband has found a legendary treasure city in the Amazon. Plenty of pirate fun, fights, double-crosses and jungle adventure follow. Really great art, too. This series has been ongoing, since 1946. It was created by Edgar P Jacobs and features the fantastic adventures of Prof. Phillip Angus Mortimer, leading physicist, and Capt. Francis Percy Blake, late of Her Majesty's Armed Forces and then MI-5. Together, they span the globe, solving mysteries, stopping evil organizations, investigating strange phenomena, and other sci-fi and espionage plots. 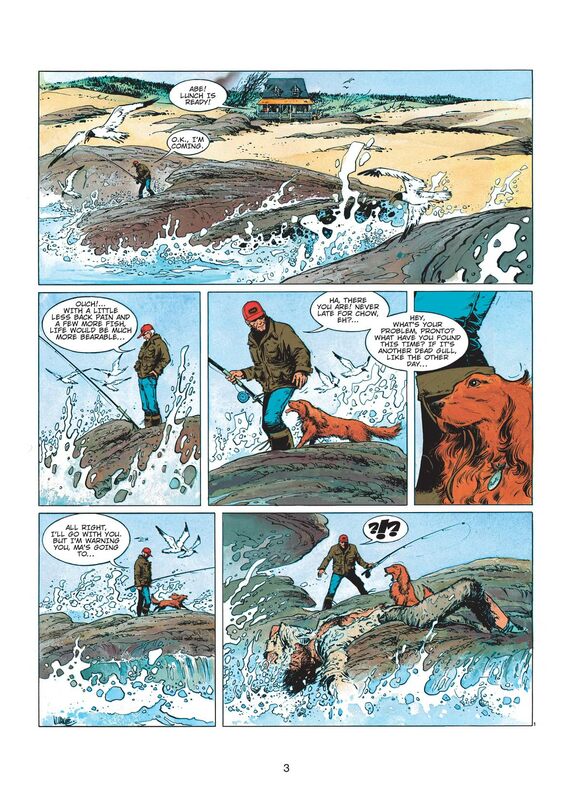 The art is in the linge claire tradition, like Tintin and other Franco-Belgian works, though more firmly rooted in the world of its time (with much of the sci-fi extrapolated from scientific theory and research). These are thinking heroes, though they are no less bold than the best of the spy/adventurers. This is probably the greatest sci-fi adventure strip in the Franco-Belgian world, mixing the sci-fi world of Flash Gordon & Buck Rogers (and Brick Bradford) with the adventure world of Terry & the Pirates, Steve Canyon, and Wash Tubbs. Cinebook has published all 24 albums of the series. Lady S features the adventures of a female spy, working for a freelance intelligence group. Her father is a roving ambassador for the US, which takes her all over the globe. Fans of Ed Brubaker's Velvet or Modesty Blaise should enjoy these. Melusine features the delightful adventures of a young with. These are shorter pieces, written for children; but, with a charming central character. 5 volumes here. Billy and Buddy are single page comics, featuring the comical exploits of a boy and his dog. These are really cute, with 6 books available. Aldebaran, Betelgeuse, and Antares are segment's of Leo's sci-fi sagas, recounting mankind's attempts to establish new colonies, on other worlds. Each cycle has several volumes, and mixes sci-fi with great character pieces. There are so many other great books at Cinebook, including the classic series The Bluecoats, Iznogoud, Thorgal, Buck Danny (just a few later era volumes, not the earlier classics), Cinebook Presents (historical accounts, including the Battle of Britain, the Falklands and the Wright Brothers), Berlin (about a bomber, in WW2), Largo Winch, Wayne Shelton, SPOOKS, Alpha, Damocles, Ducaboo, Col. Clifton, and more. You can find childrens' humor and adventure, espionage, romance, adventure, supernatural, sci-fi, historical accounts, swashbuckling tales and more. You just won't find much in the way of superheroes. For my money, one of the best batman graphic novels (and stories), ever. This one slipped past everyone's radar, given a total lack of marketing, at Marvel/Epic, a then-relatively unknown James Robinson and a not that well known in the US Steve Yeowell. Great story, though, involving journalist, a Nazi war criminal, and an airship, among other totally cool elements. This really delivers intrigue and suspense and develops a pretty good character. Marvel kind of dumped this on the market, to little fanfare. I bought mine for a buck, at a Dollar Store. Denny O'Neil and Russ Heath have some fun with the Shadow and the Nazis. Heath is having a blast, though it lacks the atmosphere of Kaluta's work with O'Neil. Still pretty darn good, though. DC/Humanoids gave us this two-volume complete reprint of Yves Chaland's Freddy Lombard. freddy is a reporter and adventurer, in the mode of Tintin, though an adult. This was both Chaland's homage to Tintin and a modernized take on that genre, though filled with the classic look of the world. There's a nice mix of mystery, supernatural, and sci-fi, done in a linge claire style. Unfortunately, Chaland's death in an auto accident prevented further stories of this great character. Juan Giminez (Metabarons, Heavy Metal movie design work) presented several stories, involving time travel and sci-fi. Really gorgeous to look at, with more straightforward storytelling than Jodorowsky. This is Jodorowsky, though a little less gonzo, mixed with tremendous art from Georges Bess. Jerome Charyn and Francois Boucq crafted this tale of a KGB agent, sent to the US. Boucq works a bit in the grotesque; but, his storytelling is first rate. Recently reprinted by Dover Books. Another from Charyn and Boucq, with a slightly surreal journey into the world of a stage magician, whose wife disappears, but doesn't return. Also reprinted by Dover. Short pieces by Boucq, including two brothers playing war, the dangerous world of insurance sales, a couple who hide body issues, and some more imaginative tales. Jordi Bernet and Sanchez Abuli's Torpedo is a fantastic series about a mafia hitman, in the Prohibition era. Alex Toth did the first story; but, balked at the level of violence. There's plenty of black humor, though, to offset some of the violence. Rocco Vargas, from Daniel Torres, is a fun-filled sci-fi/space opera romp, mixing a bit of PI intrigue, some espionage, and plenty of art deco stylings. I've often been interested in Cinebook's offerings. but I find their US availability to be pretty difficult.. Amazon seems to stock only random bits.. anyone had better luck? Or have I just not looked hard enough? I've always been able to get them via Barnes & Noble. Glancing through Amazon indicated a lot of it there; may depend on the series and whether it is one of the early or later volumes. I know a few volumes are listed as out of stock on their website; but, they are usually very early ones from series that only had a few volumes, in total. One of the frustrating things about following European series, in English, is the lack of support in the US, which translates into short term offerings. NBM used to be a great source; but, they pretty much dried up by the early to mid-2000s, as far as European works. Dark Horse has dabbled. The DC/Humanoids relationship was relatively short-lived. I'm sure some of it is tied to publishing licenses. I've seen secondary sources, for reasonable prices, though (like Amazon's marketplace). They are distributed via National Book Network (for bookstores) and Diamond (for comic shops); so, there's no reason why they shouldn't be orderable, depending on on-hand stock. Amazon also listed Kindle editions, and I saw some as Nook Books, at B&N (those are e-pub format, so there may be other ebook sources). Cinebook seems to have a good relationship with Media-Participations, which controls the big European publishers, including Dupuis and Dargaud. I just saw a solicit ofr October for Gomer Goof (Gaston, in Belgium), which will be really great. Enki Bilal is one of the most acclaimed of the next generation of European stylists (after the initial Metal Hurlant generation) and his work has appeared here, at Heavy Metal and via the DC/Humanoids association. The Nikopol Trilogy (Gods in Chaos, Woman Trap, Cold Equator, to use the English titles) features a prisoner who returns from space exile to the fascist state that imprisoned him, at the same time a group of space traveling gods have reappeared. The god Horus merges with Nikopol to get around. Together they work against the corruption of the society. The second volume introduces journalist Jill Bioskop, who ends up with the duo. The art is amazing, though the story can get a bit esoteric. Bilal later adapted it into a movie (Immortel Ad Vitam, aka Immortal), which made extensive use of CGI sets and characters, though it never really rises above an artificial look. It also doesn't make the story any clearer. Bilal works more in metaphor in this series. My personal favorites of Bilal's works are his collaborations with Pierre Christin. Christin is a fantastic writer and his stories touch on real issues and events, while centering around interesting characters. Add Bilal's art and you have great work. The Ranks of the Black Order (aka The Black Order Brigade) tells the tale of a group of veterans of the Spanish Civil War, who fought for the International Brigade and who learn that a fascist group, the Black order Brigade, who committed atrocities, are alive and spread across Europe. The former comrades come back together to hunt them down, a journey that takes them across Europe and even beyond the Iron Curtain. Great novel of intrigue and obsession. The Hunting Party features a noted Communist official, who was a mentor to other young Communists, across the Iron Curtain. He is old and infirmed now; but, a grand hunting party is still carried on. One of the members is going to kill him, as he is also responsible for suppression within the satellite states. Again, another great novel of mystery and intrigue, which revolves heavily around the characters. The Town That Didn't Exist features a group of villagers who get together to dream a utopia into existence. However, not everyone thinks it is a good idea, as entering the utopia means leaving the rest of the world and people behind. Interesting philosophical work, somewhat influenced by fantasy work from people like Winsor McKay (Little Nemo in Slumberland). It was also collected into Townscapes, by DC/Humanoids, along with The Stone Ship and The Voyage of Those Forgotten. Bilal has more work out there in English, including Exterminator 17 and The Dormant Beast. I can't recommend graphic novels and leave out Will Eisner. This is preaching to the choir; but, the man knew how to tell a story, even about average people. We all know about A Contract With God, and its place in graphic novel history. It's fine; but, I like some of Will's other works better. The Dreamer is Will Eisner's memoir of his early days in comics. It's a bit fictionalized though most of the stories in it have been confirmed in one form or another. Where else can you see a depiction of Jack Kirby chasing off a mobster or a competition between Eisner and Lou Fine as to who can create a thinner line? The book is filled with comic book history, told in an engaging and humorous fashion, by the man who lived it. To the Heart of the Storm is another memoir; but with less comedy. Eisner recounts his childhood and early adulthood and the anti-semitism he often faced. It's a more brutal reality than The Dreamer, though there is humor there, to. The art is also a bit more evocative. Invisible People tells stories of people whose lives go unnoticed. This has some really emotional stuff in it and really shows the humanity that Eisner constantly tapped into. Dropsie Avenue is a really interesting one, for this reader, who grew up in a small farm town, in central Illinois. Eisner shows the history of one New York neighborhood as it changes and evolves over the years. We see it go from a slightly rustic locale to a heavy urban space, with different ethnic groups moving in and out of it, over the decades, and how the character of the neighborhood changed. It's a fascinating look at urban life. Last Day in Vietnam was one of Eisner's last works and it is an interesting one. It featured 6 stories of soldiers, in different wars, either based on Eisner's personal experiences in the military or working with the military on PS Magazine. Eisner is a great observer of humanity and a peerless storyteller and all showcase that. It's pro-soldier and anti-war, yet never gets bogged down in politics. It just deals in people. So, those are my favorites; but, all of Eisner's books are worth reading. The man knew humanity and captured it well. He is a master of subtlety and comic timing, as well as a great illustrator of emotion. This is a man who always thought comics could be an art form, even as his contemporaries looked for a way to get out of them. Eisner, more than just about any other individual, demonstrated how comics could be and are an artform. ^^^ Agree with all of this. I re-read "To the Heart of the Storm" in prep to contribute to this forum this month, but a lot going on at work, so spoending non-work hours away from the keyboard.